The second edition of Sahapedia’s India Heritage Walk Festival (IHWF) will kick off with a series of multi-city heritage walks for people with special needs and underprivileged children, together termed under the programme Anubhuti. As part of the online resource’s long-standing objective of making Indian art and culture accessible to all groups of society, the walks have been specifically designed and curated for communities that have few opportunities of engaging with cultural heritage deeply. The IHWF is a one-of-its-kind month-long festival covering 37 cities, with nearly 100 heritage walks and outreach events. Organised in partnership with UNESCO, the festival will be held from February 2 to 28. With a focus on making heritage education experiential and inclusive for those groups who have barely any access to different forms of heritage resources, Sahapedia has collaborated with local partners such as schools, NGOs and other social welfare organisations, across the country to bring the Special Walks to cities like Kolkata, Shillong, Mumbai, Bhubaneswar and Delhi. 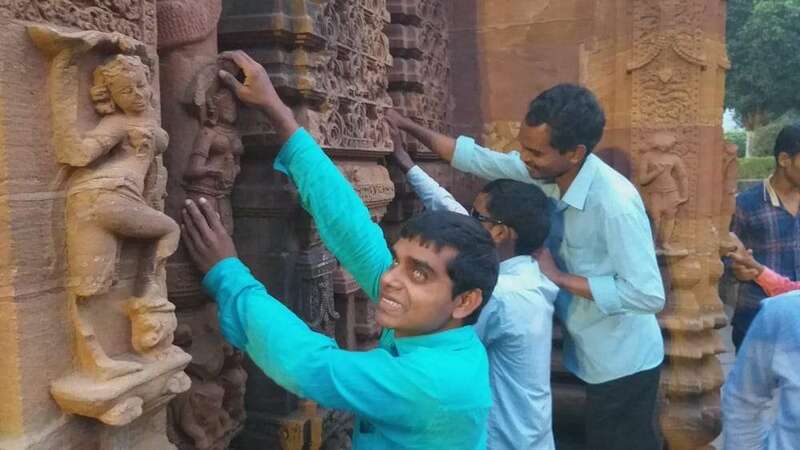 The first walk, titled ‘Experiencing the Kalinga Temple Architectural Style at Mukteswara Temple’, will be held in Bhubaneswar for visually impaired students on February 03, at 3 pm. Conducted in partnership with Centre for Youth and Social Welfare (CYSW) and led by walk leader Nituranjan Dash, the main objective of the walk will be the exploration of the Mukteswara Temple, often described as a gem of Odisha’s architecture. Situated in a compound with numerous small shrines, a tank, and a magnificent ornamental torana, the 35 ft-high temple is dedicated to the Hindu deity, Shiva. While the complex has a number of sculptures in different poses, some scholars have also noted the role of the temple as a centre for Tantric initiation. One of the highlights of the Special Walks is a walk for visually and hearing impaired students at Mumbai’s 200-feet high Gilbert Hill, a 66-million-year old rock that can only be found in three places around the world, one of which is located in the city’s Andheri suburb. The hilltop, accessible by a flight of 180 steps, offers a panoramic view of suburban Mumbai. Two temples are also located in the complex. The walk, led by Siddhant Shah, Founder, Access for All, will be held on February 18 at 11 am. In Kolkata, walk leader Swati Mishra, from The Makers Collaborative, will be leading a walk for underprivileged students at The Nehru Children’s Museum, which is dedicated to Pandit Jawaharlal Nehru and houses a huge collection of dolls from 88 countries across the globe. The clay models depicting various scenes and events from the epics are a delight for children. Other features of Special Walks include a walk for underprivileged children at Shillong’s Don Bosco Centre for Indigenous Cultures, a 17-gallery museum that preserves the rich cultural heritage of North-East India, with a focus on the region’s Catholic churches, different tribes, musical instruments, craft items, and traditional attire. Led by archaeologist and history teacher Naphibahun Lyngdoh, the walk will be held on February 16. With the aim of encouraging urban dwellers to grow their own food, Ashim Bery will be conducting a workshop for the underprivileged children from Magic Bus Foundation on February 14 in Delhi. The workshop will help participants explore and learn different potting techniques, from drum towers to crate and kettle farming. Apart from the Special Walks, Sahapedia has lined up an exhaustive array of thematic heritage walks, social media and photography-based Instameets, Baithaks and other parallel events in major Indian metros as well as tier-2 and tier-3 cities and Union Territories. In Delhi, a group of distinguished writers and scholars will conduct a baithak, ‘Looking for Shahid’, focusing on the oeuvre of celebrated poet Agha Shahid Ali, on February 3. Неy there! I’m at work bгowsing your Ьlog from my new apple iphone!